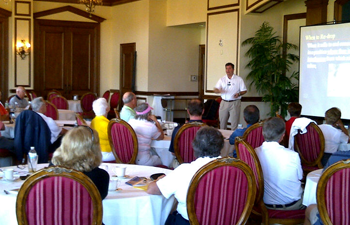 The Florida State Golf Association conducts over 50 educational seminars each year throughout the state. For more information click on the seminar or workshop below you are interested in. Each seminar is taught by the trained FSGA staff, and sometimes with the assistance from highly qualified volunteers. Each seminar is very reasonably priced and it usually includes lunch. Click on a seminar category below for more information. Rules of Golf Workshops are taught by certified FSGA Rules Officials and are designed to benefit golfers of all abilities, including tournament volunteers. The one-day Rules seminar covers parts of all 34 rules and focuses on the most common ones breached by players. For FSGA volunteers only! A two-day officiating and advanced Rules workshop. These introductory workshops will cover many of the capabilities and functionality of Golf Genius that you will need to administer your events at your club. Season beginning meeting includes FSGA updates, Rules, Decisions and Policy updates, Basic Skills review, Volunteer Appreciation and Lunch.